You must click here. Don’t trust me, eh? If you enjoy barbecue and North Carolina history, you must click here. Still don’t trust me? The links above lead to the NCPedia entry on barbecue, which includes a nice little slide show of historic photos. If you want just the photos without the accompanying article then click here for the 45 picture slide show. 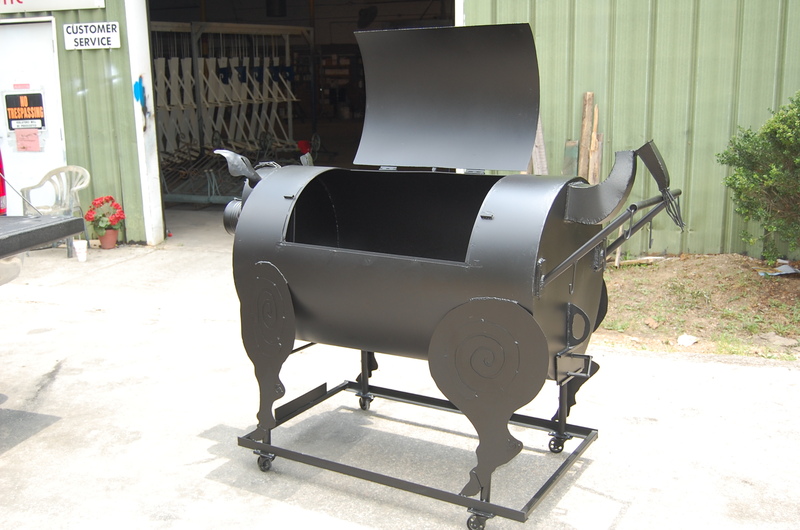 Attached are several photos of a new, larger pig shaped pig cooker I recently made and shipped to a BBQ fanatic in Alabama. 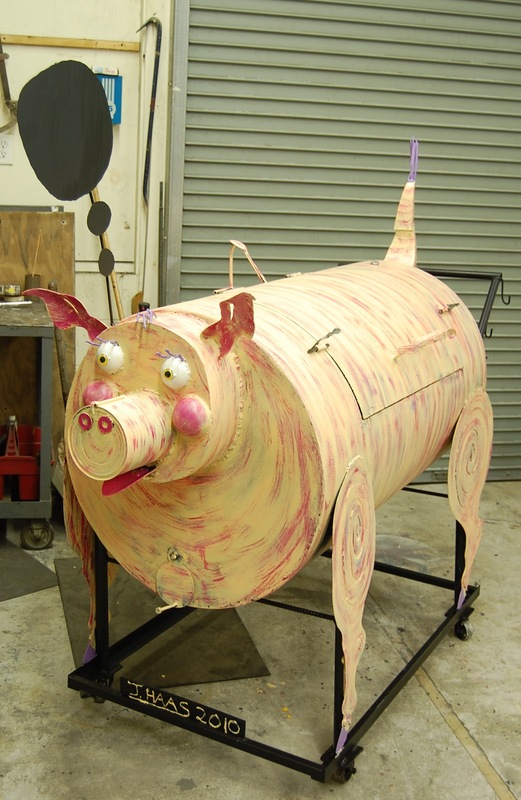 The tail opens to make a smokestack; there is a steel “thought balloon” painted in chalkboard paint on which a cook can write messages or “pig thoughts”; used charcoal and wood is cleaned out of the “ashhole.” The inside grill racks can be set at a steep angle over the coals allowing one to place slower cooking meat high up on the rack and faster cooking items lower of the racks where they are just over the coals. There are a number of hooks for hanging implements on the push handle; the grill opens using a handle made of forks and spoons. One of the photos shows the grill at the powder coat painter’s with the side open and tail open (see inset); the black heat resistant paint is good to 1200 degrees F; there is a small hole to set a thermometer in near the tail. As usual, there are NO provisions for the unrighteous and heretical practice of gas grilling. With apologies to the people of Japan, and people anywhere who practice the art of haiku or any other form of poetry, I present to you my first attempts at creating a new art form called hogku. In case you don’t know, haikus (at least the Americanized version) stick to a basic 5-7-5 syllable structure. Below are my first hogkus. Readers, any hogkus or other barbecue-inspired poems to share? 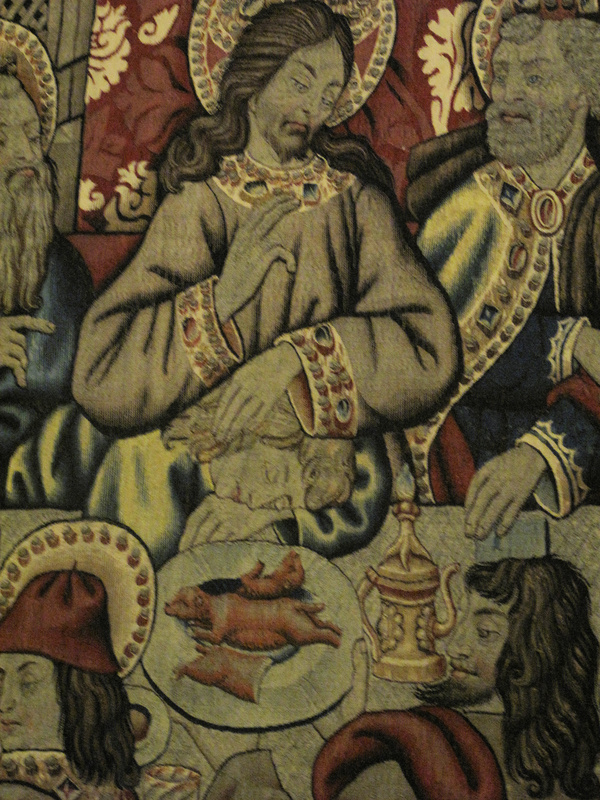 Where is the pig meat? We recently received an email from Joel Haas of Raleigh, who kindly agreed to let us share excerpts from his witty message. Joel’s email begins as follows: “I am very, very grateful that my Jewish grandfather who immigrated to NC in 1900 didn’t take his religion seriously and married a Methodist girl, or I, a NC born and bred back sliding screaming left wing Episcopalian, would not be enjoying the joys of Q.” How’s that for an opening salvo? Joel’s email continues, “My true religion is ultra orthodox right wing don’t even talk-to-me-about-using-gas hickory-smoked Eastern NC Q. I am in a mixed marriage since my wife is from near Lexington and Salisbury NC.” Since Mrs. Porky LeSwine is from Illinois, thankfully I do not have to deal with such contentious debates at my home. After all, Illinois produces corn and corn is enjoyed in cornmeal form throughout both of North Carolina’s regional barbecue empires. Of course, Mrs. LeSwine has never taken a shine to barbecue, so not all is well at my home.